An eye-catching lab grown diamond right hand ring including two round man made diamonds. Available options: platinum, 14k or 18k gold: white, yellow, rose Makes an excellent gift for a mother of two children. Customize with fancy pink or fancy blue lab grown diamonds. 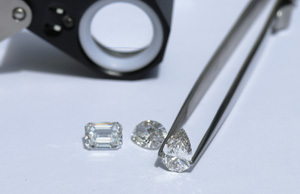 All of Ada's diamonds are hand-selected for quality, fire, and brilliance and are guaranteed conflict-free. Ada Diamonds Design Description- This delightfully modern ring features two round brilliant lab grown diamonds in 14k white, yellow or rose gold settings. Makes an excellent gift for a mother of two children or to celebrate a two year anniversary.